A fun little side project of mine is Arduino C/MRI, a library that lets you easily connect your Arduino projects up to the JMRI layout control software, by pretending to be a piece of C/MRI hardware. Hence the name. 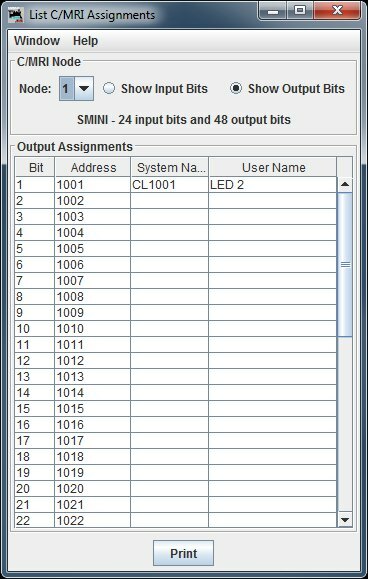 The basic "hello world" example is fairly straightforward, wiring up a JMRI light to a physical LED on the Arduino board. It's easy enough to extend this example to handle 5, 10, even 15 outputs... if you have an Arduino Mega, you could have a LED on every pin and have 48 LEDs driven by the one board. But what happens when you want to have 49 outputs? Lets look at each of these options in turn. An SUSIC which is configurable; it has 64 slots, and each slot can be either an input or output card. Each input and output card can address up to 32 lines. If we configure a maximal SUSIC with 64 slots, each one with a 32 bit output card, that gives up 2048 outputs! Configuring that many outputs will take a while; I settled on 8x 32 bit output cards to test with. Then create a couple of lights (Tools > Tables > Lights), one at address 1, and the other at address 256 (JMRI has 1-based indexes for its inputs and outputs). Toggle each one and you can see the appropriate output LED lighting up. This raises an interesting side question though: Arduino's don't have 256 pins, so how do we address that many pins? Luckily I have a tutorial on doing just that: Addressing many LEDs with a single Arduino. This is an interesting case. C/MRI is bus-based, which means the protocol is built from the ground up to address multiple nodes. There is nothing in the protocol however which requires physically separate nodes, so with a few tweaks of code, we're able to quite easily make our single Arduino respond to multiple addresses. So what is going on here? First off, we now have two CMRI objects in our code. The first, cmri0 is set to address 0. The second, cmri1 is set to address 1. That means we now have two independent CMRI objects, one responding to address = 0, and the other responding to address = 1. Then in the main loop we differ a little bit. Normally we would just call jmri.process() which would handle reading in and processing the serial data. However that won't work with more than one node, as the first node clears the serial buffer as it reads it, so the second node will never get any input. To solve this, we handle reading the serial data ourselves. First we read in the serial data, then each node in turn processes the same piece of data. 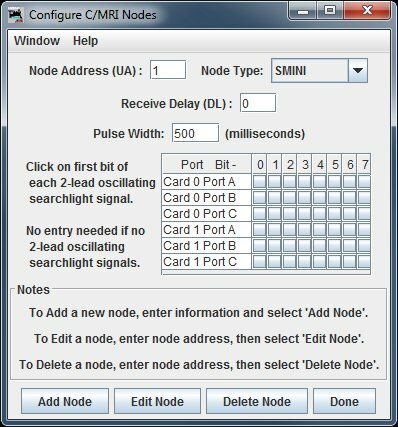 To set this up in JMRI, you need to add a second SMINI node with address = 1. 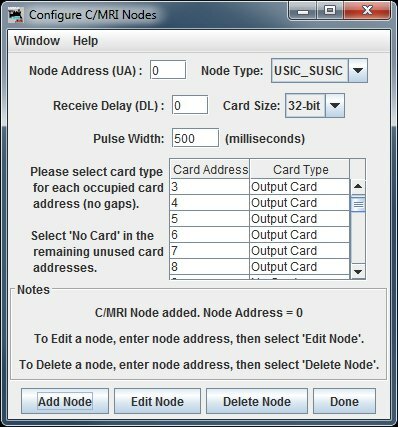 This can be done in the JMRI preferences window by opening the 'Configure C/MRI nodes' window, entering 1 as the node address, and then clicking 'Add Node' to add the configured node. Here we can see that node 1 has the first output assigned. Emulating multiple nodes inside of one Arduino is one possible approach to expanding your outputs. But what if you need your nodes to be physically separate? Maybe they are on different modules, or there is a very long distance between them which makes running dozens of wires less practical? In these cases it may make more sense to have multiple physical Arduino nodes, each emulating their own C/MRI node. The obvious approach to setting this up would be to add multiple C/MRI nodes in JMRI, each on its own serial port. Unfortunately while it is possible to set this up in the options, it does not currently work (as of JMRI 3.5.3). Nodes â€“ each node is an Arduino running Arduino C/MRI. Instead of a regular TTL USB/Serial connection, the serial input and output are routed to an RS485 bus. Each node has a unique address. Bus master â€“ Whereas normally an Arduino would connect directly to the PC via USB, when running in a bus setup, it is the bus itself that needs to connect to the PC. This is done with an RS485-USB adapter. Since the C/MRI protocol is a "don't ask, don't tell" type protocol, no node should speak unless specifically asked to, i.e. it is a polled protocol. That means that access control is taken care of by JMRI. It will either be broadcasting output control packets onto the bus, or it will be asking a specific node to transmit an input status packet. While the latter is happening no other packets are transmitted over the bus, ensuring no collisions between different nodes and packets. Such a set up will be the focus of a future article. We now know of three different approaches to controlling more than just the default 48 output channels. Each has their pros and cons. By combining approaches 1 and 2, we are able to address many dozens of nodes, each with 2048 digital lines. And, if we wanted to, we could combine this with approach number 3 and place the nodes on a bus, letting us spread SMINIs and SUSICs all over our railway. Hi Adam, this is brilliant, its exaclty what i was looking for, just started to play around with this, im using the arduinos for occupancy detection. Im using reed switches embedded under the track and magnets in the fuel tanks of locos. i have put 22uF caps across the reeds to delay the closed circuit time so that the arduino has enough time to react (if the trains are going fast enough the arduino would not capture the switch) but all works fine now will be getting to grips with the scripts in jmri for full automation. Thanks again!